ASTA's White Papers and Research Reports are available for sale though our ASTA Store. ASTA's research reports include both research conducted by ASTA and research commissioned from third parties. The Travel Agency Benchmarking Series is based on surveys conducted with our Research Family panel of agencies. 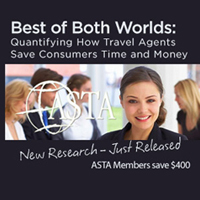 Other recent research commissioned by ASTA includes Consumer Awareness research, Best of Both Worlds: Quantifying How Travel Agents Save Consumers Time and Money, Traveler Decision Making Study and Value of Travel Agents Study. sheds light on America's perceptions of travel and better enables ASTA and the travel agent community to serve as the voice of America's travelers, just as travel agents serve as the voice of their clients every day. 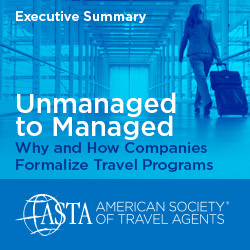 ASTA has partnered with The Company Dime to conduct a study on the conversion of unmanaged business travel to managed travel. The results of this executive summary come from in-depth research consisting of a survey plus interviews with travel management company executives to understand the reasons large and small businesses implement travel management practices. 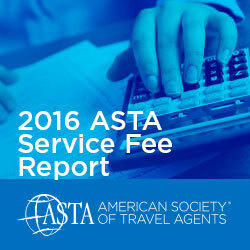 The ASTA Service Fee report, seeks to discover current service fee practices in the travel agency industry in addition to travel agents’ exploring other revenue sources such as consultation fees, travel insurance, mark-ups and others. 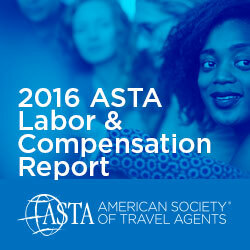 ASTA’s annual Labor and Compensation report seeks to discover current employment trends and compensation models in the travel agency industry. Insights into compensation packages and classifications, recruitment of travel agents as well as agencies’ plans to handle the new Department of Labor (DOL) overtime regulations will be beneficial to various industry segments related to travel agencies. This report provides a generous amount of data and information on the financial trends of ASTA agency members including revenue, sales, transactions, number of clients, profit and so on. This information will be very beneficial to current and prospective ASTA members, consortia, franchise companies, host agencies and supplier partners alike. A growing consensus within the travel agency industry is that the independent agents community is continuing to grow and that industry suppliers are allocating more resources trying to better engage these travel agents whose primary work location is often not a brick-and-mortar storefront or office location. This year's independent consumer study uncover consumer travel trends and find patterns related to overall travel agent usage in planning and booking trips by travel type, the factors related to how a traveler chooses a travel consultant, and for what occasions they use an agent. This study finds an increasing issue for many travel agencies is the ability to hire new employees. Agency finances have improved compared to 2009. Average agency sales have returned to pre-downturn levels. This report profiles the independent agent population. There is much variability in this population. The GDS reports covers travel agency distribution trends related to GDS usage from how agencies book travel to how they negotiate their contract. Agencies evaluating their current GDS contracts and industry suppliers wanting to understand GDS usage better will find this report essential. Access to online outlets and social media has increased the number of agents and agencies that can market their niche expertise. 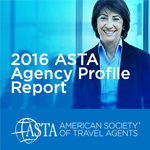 73 percent of ASTA agencies report that they have expertise in at least one niche market. This 43-page report covers technology issues including software and mobile tools used, internet booking patterns, website content, social media policy and online booking tools used. The Value of Travel Agents study surveyed U.S. leisure and business travelers on their travel agent usage and satisfaction with travel organized by an agent. Additionally, this 271-page report includes demographics on travelers including trips taken, sources of travel information and how they book. The ASTA Green Guide for Suppliers provides educational material on understanding and marketing sustainable travel to travel agents and agencies. The report highlights best "green" practices and marketing tips as well as information on becoming an official ASTA Green Member. The ASTA Green Guide for Travel Agents provides educational material on understanding and marketing sustainable travel. The report highlights best "green" practices and marketing tips as well as providing information on becoming an official ASTA Green Member. The Supplier–Travel Agent Relationship Marketing Reports examines how travel agents chose suppliers and book different travel segments. The type of knowledge agents need from suppliers when promoting travel is also explored. Only half of agencies have a marketing plan with nineteen percent planning to develop one in the future. 2012 Service Fee ReportChanges in market forces have resulted in more agencies charging service fees compared to the early 2000’s. Agency finances have improved compared to 2009 and 2010. Average agency revenue and sales have almost returned to pre-downturn levels. 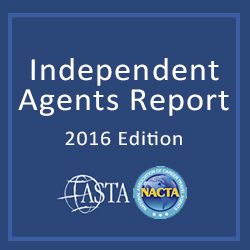 The report profiles the independent agent population. Explored are typical commissions split, sales volume, business mix and relationships with suppliers and host agencies of this much varied community. The ASTA Green Guide for Supplier Members provides educational material on understanding and marketing green travel to travel agents and agencies. The report highlights best "green" practices and marketing tips as well as information on becoming an official ASTA Green Member. 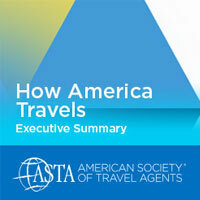 ASTA assisted PhoCusWright in updating their 2008 Travel Agency Distribution Landscape Report. The new report was published in March 2012 and is available for purchase. The 2011 Independent Agents report includes typical booking methods, host agency relationships, average sales, and the top travel suppliers used. This report will help you better understand the Independent Agent's business operations and their place in the travel market. 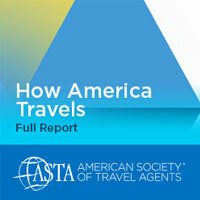 ASTA conducted this annual study to better understand changes in technology and web usage by travel agencies. The report covers the use of technology including software and mobile tools, internet booking patterns, website content and online booking tools. The information from the Project 85 study will provide the data needed for agencies to determine if there is an opportunity in serving the drive market. The results of the Technology and Web survey reflect that most agencies are very comfortable with standard technology. This survey found leisure agencies doing much better in 2010 than in 2009. Agencies reported the strongest rebound in sales for Rail, Hotel, Tour/Package/Group, and Insurance. Their expectations for 2011 are mostly positive. The Corporate Agency Report covers transaction-fee versus management-fee contracts. It looked at which special services trigger an additional fee or which ones are covered under the contract. It also looks at other fees the agency may charge. This report profiles Independent Agents and gives you the information you need to better understand the Independent Agent's business operations and their place in the travel market. This report assists travel agencies and suppliers in understanding and benchmarking typical agency-supplier business arrangements and booking methods by travel segment. The Service Fee report assists both corporate and leisure agencies in benchmarking their service fees. ASTA conducted this annual study to better understand changes in service fees. The report looks trends in fees charged, how fees are collected, and how customers are informed about fees. 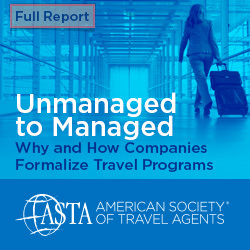 ASTA and The Beat conducted this survey to provide insight into changes in distribution, economic norms, and technology use among corporate travel agencies in relation to the marketplace shift. 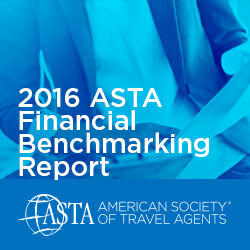 ASTA conducted this labor and compensation study to assist travel agencies in benchmarking their compensation, benefits and hiring practices. This information can be used to benchmark your own compensation and benefits, and may help you improve your hiring practices. A free 3 page summary is available to all members, a full report is available for purchase. The Financial Benchmarking report gives an agency the ability to analyze The revenue data in this report can be used by agencies to determine if their products are the best revenue-generating mix for their business model. The 2009 ASTA Technology and Web Usage Report covers issues including the use of technology, internet usage for research, internet booking patterns, and website design and usage. The 14th Annual Gay & Lesbian Tourism Study of Community Marketing (CMI) contains a detailed statistical analysis of the 4,700 gay and lesbian consumers who reside in the United States. The report includes CMI’s annual gay and lesbian destination rankings, effects of the recession, and a list of the top travel brands outreaching to the market. Non-resident inbound visitations to the U.S. has grown over the past 20 years, but there have been shifts in the originating countries. In the past 20 years, the number of U.S. resident outbound visitations has been fluctuating. Overall, there has been growth in outbound visitations and some shifting in where U.S. citizens visit. The Agency Business Trends Report looks at changes agencies made to weather the past year as well as changes planned for the future. The report benchmarks plans for operations and employment for leisure and corporate agencies. This report shows several shifts in the independent agent population, specially in what is the primary source of income for agents. A strong relationship between suppliers and travel agents is imperative if both sides want to increase their businesses. This report found that agents that engage in a preferred supplier relationship often do so based on the supplier’s reputation and quality of their product. The study examines growth of the packages travel industry between 2006 and 2010. Specific segments are also broken out including escorted tours, packages, FIT and group. Please reference staging environment error 1497368 in communications regarding this issue.